We spend a lot of time in the bathroom, so why not make it a beautiful space you love being in? Whether you have a bright eclectic vibe or a more classic spa-like style we have all the pieces you need to bring your space together. Start with a shower curtain and build from there adding accessories, bath mats, plush towels and robes. 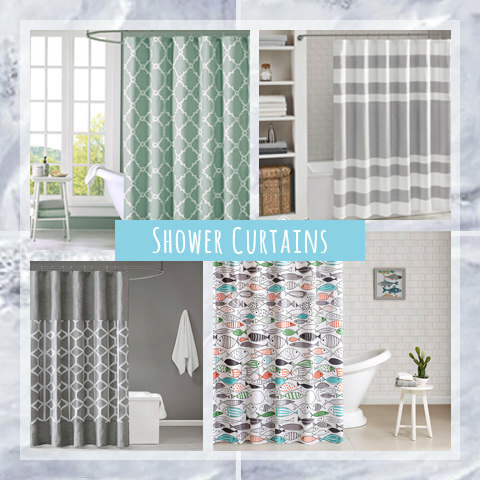 At Designer Living, we have created a collection of bathroom shower curtain ideas and other bathroom decor so you can make every room of your home stand out. Since this is one of the smallest rooms of your home, every detail makes a difference. Our selection of bathroom rug decorating ideas offers great inspiration to help you tie the entire space together. Get inspired now with our bathroom decor inspiration offered at Designer Living. Choose a shower curtain that shows off your style: modern and geometric, bright and graphic, or classic and serene.The shower curtain should be the star of the show. Make this the main focal point that people see as soon as they walk into the room. Before choosing your shower curtain, prepare yourself on the different types and styles that are available. Whether you want a casual cotton shower curtain or a more sophisticated decorative shower curtain, you have endless options to choose from depending on the overall look you want to achieve. This piece plays an essential role in your bathroom. Not only is it the largest decorative piece in the room, but it also serves an important job as well. Your shower curtain is meant to repel water and keep your floors nice and clean. That’s why it’s crucial you find something that is both stylish and functional. For more inspiration, check out our wide selection of shower curtains on our website now. Bath rugs and mats should coordinate with your curtain, but doesn’t always have to be a perfect match. 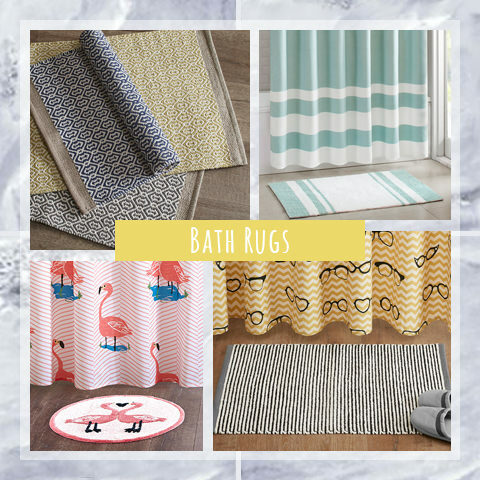 Have some fun with your bath rug and get something that is fun yet complimentary to your overall bathroom decor. Keep in mind that the bath rug is a critical element to any bathroom with a shower or tub. Don’t let this piece be forgotten. Find a bath rug that is both functional and stylish. Pick a pattern in a corresponding color to tie the space together. 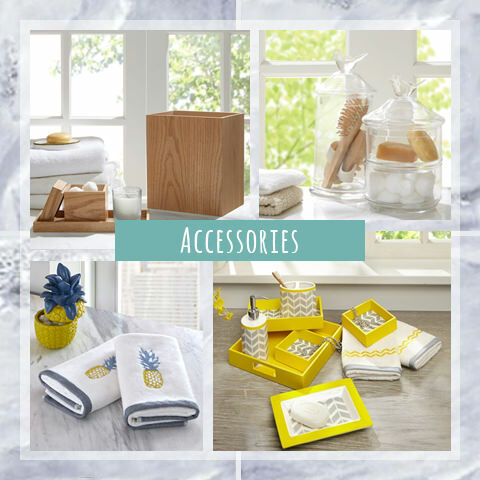 Bath accessories are functional but also add great style elements to your space. Soap or lotion pumps and trays help keep you organized with everything right at hand. Bathroom accessories are an excellent way to keep your toiletries in one place while still adding a touch of style. Depending on the feel you are going for, you can either find eye-catching matching accessories or more simple and modern pieces. If you already have a bold color scheme and printed shower curtain, try adding white or glass bathroom accessories to give a modern flare. Your bathroom would not be complete without the towels and robes. In fact, this is the only element that can provide you with true ultimate comfort. When shopping for towels, makes sure they compliment the colors that you are already working with in the rest of the room. You can either add a pop of color or you can compliment the space with neutral tones that flow effortlessly with your existing design. When it comes to your robe, this is more of a personal preference. Try to find one that can work in any season. Most importantly, comfort should be your first priority. Once you have found the perfect fabric, you can customize your lounge wear by selecting your favorite colors and styles. 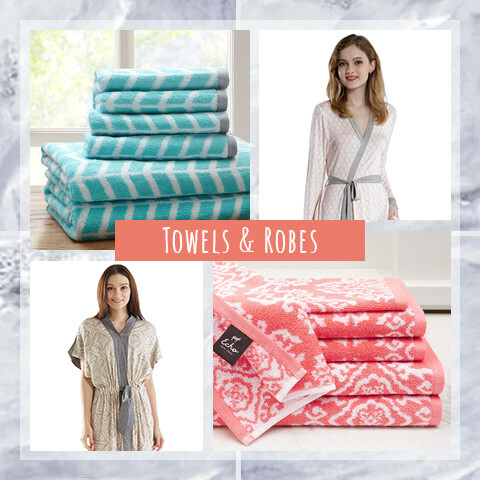 Plush and soft towels and robes complete your update. Wrap yourself in comfort! Use wall art to complete your bathroom update. Wall art immediately elevates any room to the next level. For more style and sophistication, find decorative pieces that are timeless and functional. Bring in pieces that compliment your style and make the room more enjoyable to get ready in!